New mother Dee Devlin has wedding guest style down to an art form. The 29-year-old, who has been dating MMA superstar Conor McGregor (28) for the last six years, gave birth to Conor Jr last month and made her first public appearance since welcoming the new arrival. 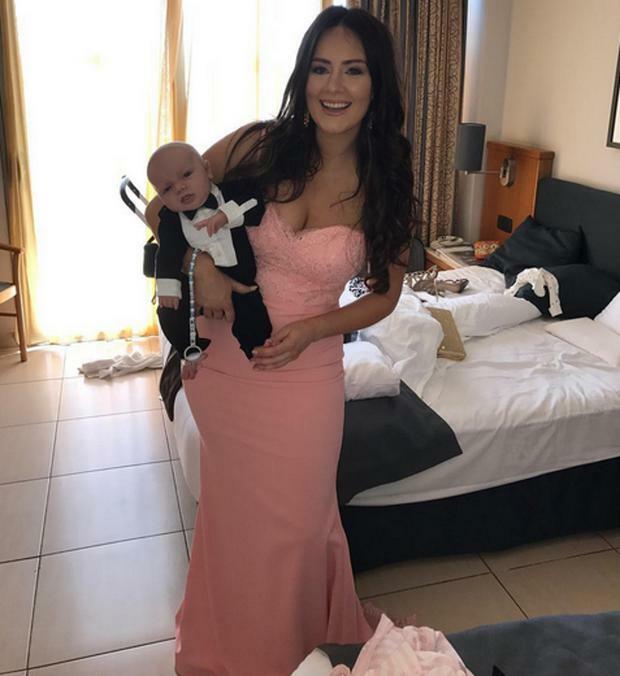 Dee, who left her job early in their relationship to work alongside her other half, attended her sister Cathy's fairytale wedding on Friday and there's no doubt she had the cutest date of the day - her one-month-old son. She opted for a figure-hugging baby pink down with sweetheart neckline, but little Conor stole the show in a tiny tuxedo - but what else was the world champion's son going to wear? New dad Conor has been busy sharing pictures of his son in designer, including Gucci runners and a Gucci t-shirt and a onesie by Irish designer Leigh Tucker. And earlier this month, he shared a photo of himself holding his newborn son with dozens of Brown Thomas bags in the background as the couple stock up on designer duds for their first child. While she shies away from interviews as her partner's star continues to soar, back in 2015, she said she always believed he would hit the big time. "It's weird for me to say but we just always knew he was going to get to this level and every few months it just keeps going and going and going and the sky is the limit." McGregor announced late last year he and Dee would be welcoming their first child and in February, he expressed fears for his baby's safety in public and warned fans not to mob him on the street. "I’m not trying to bring a kid into that. If someone comes near me when I have my kid in my hands, like the way they come near me now, looking for pictures, someone’s gonna be badly hurt," he told GQ Magazine. Similarly, the MMA superstar said he would be taking some time off after welcoming the new arrival to spend with his family and doesn't want their lives to become a celebrity circus. He fuelled speculation that the pair could be welcoming a son when he referred to the baby as "him" during an interview at An Experience With Conor McGregor event. Conor McGregor's world-renowned trainer puts our reporter through her paces - how did she get on?